Wildlife friendly. Won't harm children, pets, bees or birds. Unlike pellets, Nemaslug works even better in the wet. Our stock is replenished weekly - always fresh. Delivery by First Class Post, mailing on Thursday. Provides around 6 weeks of protection. Follow the instructions on the pack. Store in the fridge and use as soon as possible, or by the date on the pack. Do not freeze. You should have about 3 weeks on the use by date. So please only order when needed. 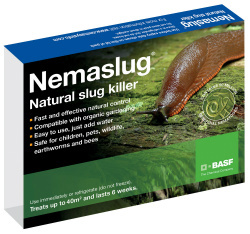 Nemaslug should be applied to moist soil that is at least 5°C. Nematodes are microscopic and to the naked eye a pack of Nemaslug looks like a pack of powder. Only available to UK postcodes.